There are so many church-goers who want to talk the talk–especially when the talk turns to their adversary, the devil. Somewhere around three months ago, this writer heard someone railing against the devil and was moved to write Railing against the Devil: What does the Bible Say? Because so many who profess to be Christians seem to be caught up in this unbiblical practice these days, it seemed appropriate to further revisit the topic. Christians are told to be very wary of the devil–that he is a particularly clever and dangerous enemy of mankind. He is the serpent, the Great Dragon, Beelzebul, the ruler of this world, the prince of the power of the air, the evil one, and the adversary. He is Satan. And—if you are a follower of Jesus Christ—he hates your guts with a passion. NOTE: Satan is NOT the “ruler of this world“–though there are many of his followers who are deceived otherwise. The Christian is not to talk the talk against Satan but to walk the walk with Jesus–and be careful! Nowhere does the Bible recommend believers saying anything against the Devil other than the word of their testimony. The believer is to always be on his guard for the tricks of the devil. This type of talk and behavior is not from God, who commands His people to be meek; to be humble. It is Satan who encourages man in his pride, vanity, arrogance and proclaiming his power on earth–where Jesus says Satan is still the “prince of this world” until Jesus comes back. It’s not like Christians aren’t warned repeatedly in the Bible about Satan. But one of Satan’s greatest weapons is human pride and vanity. 1- Don’t rail against the devil: that much is crystal clear upon studying the Bible. More on this in a bit. 2- There are no end of Satan-rebukers in the world today. But nowhere in the Bible does it state that Christians have the authority to rebuke the devil. The Bible does not give Christians the authority to rebuke the devil, but to resist him. James 4:7 says to “submit yourselves, then, to God. Resist the devil, and he will flee from you.” Zechariah 3:2 tells us that it is the Lord who rebukes Satan. Even Michael, one of the most powerful of the angels, did not dare to accuse Satan, but rather said, “The Lord rebuke you” (Jude 1:9). In response to Satan’s attacks, a Christian should appeal to Christ. Instead of focusing on defeating the devil, we should focus on following Christ (Hebrews 12:2) and trust that He will defeat the forces of evil. We are told that GOD–not humans–“will bruise Satan under our feet.” Humans are not God. Christians are not to rail (to revile or scold in harsh, insolent, or abusive language) against the devil–or other humans; or ANYONE, for that matter. The above verse should, by itself, stop the entire Dominion Theology movement and their “ministers of righteousness” who call themselves modern-day “apostles and prophets.” However, since when did the Bible ever stand in the way of antichrist Dominionist/NAR/IHOP ambitions? When did what Jesus say ever convict those who prattle on about “raising up an end times army!” or “We’re becoming mighty prayer warriors for Jesus!”? 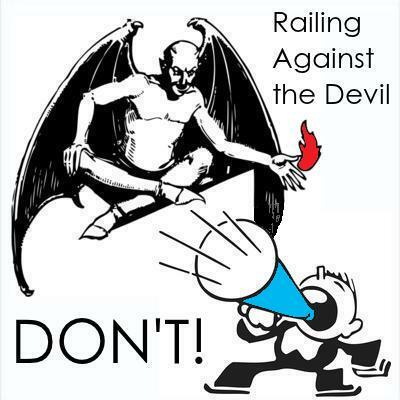 —Railing against the Devil: What does the Bible Say? Since the God’s Word contains so much useful information on the tricks the devil uses and how to successfully oppose him, Satan has spent centuries raising up alternative sources of authority. These are used to drag man away from the Bible and to ultimately discredit the Bible in man’s eyes. It is only by discrediting God’s Word that Satan can hope to achieve victory over man. Some of these alternative sources of authority are: science, psychiatry, psychology, archeological artifacts, ancient writings, cults, pagan gods, mythology, men exalted by other men, man’s written history outside of the Bible, the pope, the church, ministers of righteousness, pretend christians, other “sacred” writings, false religions, the media and peers. All of these may be used in an attempt to undermine the Word of God in the Christian’s mind. Particularly useful to the enemy is new doctrine. To this end, Satan has raised up new forms of christianity, his own versions of the end times–and what will happen–and his very own network of “apostles and prophets” who are beholden to him, not God. Satan has spent years, decades–in some cases, centuries–raising up challenges to God’s Word. Satan is a resourceful and clever foe. Christians are not to rail against him. Christians are to submit themselves to God and then resist the devil.